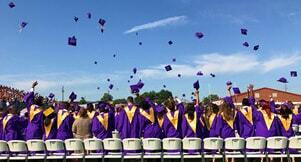 Bleckley County High School (BCHS) recently had the highest 4-Year Cohort Graduation Rate in the Middle Georgia area at 97.3%. Bleckley County Schools are SACS- accredited and BCHS is “Accredited with Quality” by the Georgia Accrediting Commission. Proximity to both Middle Georgia State University and Oconee Fall Line Technical College gives BCHS students many opportunities for dual enrollment, and BCHS introduced Georgia’s Move On When Ready program in cooperation with Georgia Military College in nearby Warner Robins. About 4,400 Bleckley County, Georgia residents participate, or desire to participate in the workforce. An unemployment rate of 7.2% in 2016 indicates the availability of workers to staff new and expanding ventures. 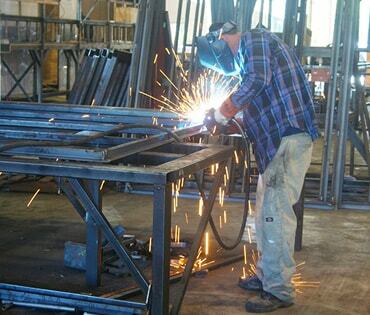 Bleckley County's primarily non-union labor force demonstrates transportable skills and strong, loyal work ethics. View Bleckley County's Labor Profile. Bleckley County’s population is estimated at 13,000 as of 2016, about half of which live in the City of Cochran, the county’s only incorporated municipality. Currently, the median age of Bleckley County residents is 37.3. More than half of the population is within the prime working age ranges of 20-64, with another 11% of the population in the working teen and college age group. Bleckley County has access to an expanded labor pool from the neighboring counties of Dodge, Houston, Laurens, Pulaski, Twiggs and Wilkinson, that collectively form our labor-shed area. This seven-county labor shed area translates into a labor pool of 108,000 workers for industries that locate in Cochran and Bleckley County. To prepare workers for the jobs coming into the area, Bleckley County has access to multiple workforce training and employment initiatives. The Cochran campus of Middle Georgia State University offers a variety of programs of study ranging from Bachelor’s degrees in biology, business administration, criminal justice, health services administration, mathematics, nursing, new media, and more, to Associate’s degrees in such subjects as financial technology, music, modern language, and political science, to certificates in subjects such as web design and cybersecurity. The Cochran campus covers approximately 182 acres with the 30 primary buildings, including residence halls, on approximately 60 acres. The remaining 122 acres are in woodlands and athletic/recreation facilities. 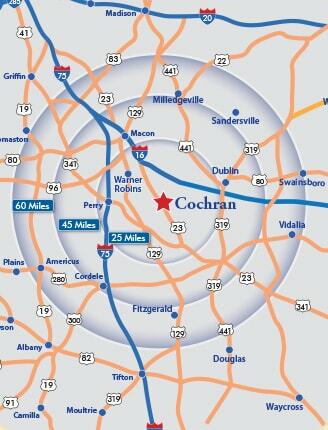 Only 17.5 miles from Cochran, Middle Georgia State University’s Eastman campus offers Bachelor’s degrees in professional flight, air traffic control, airport management and logistics, and Associate of Applied Science degrees and certificates in flight, aircraft structural, avionics and aircraft maintenance. Oconee Fall Line Technical College (OFTC) has a campus in Cochran, Georgia where students may enroll in more than 100 associate degree, diploma and certificate programs, in addition to specialized training through continuing education, contract training, and workshops. OFTC is also the area provider for Georgia’s highly rated Quick Start workforce training program, available for free to qualified companies. Developed as an incentive for companies to locate in Georgia, Quick Start provides job specific training for Georgians to enter the workforce in the state's new and expanding industries. The Heart of Georgia Altamaha Regional Commission offers workforce development services at Job Training Unlimited in Cochran, Georgia, including an On-the-Job Training or OJT program provided by the Workforce Investment Act. An employer hiring an OJT worker will be reimbursed up to 50% of the employee's wages for a specified training period. The training period is usually four to six weeks, but can be as long as six months for a highly technical job. Other services include computer assistance, employment counseling, resume preparation, employment readiness workshops, and more.